Call us and order a banquet! 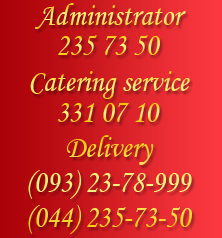 We can offer few different options of banquet menus for the required number of visitors. Wuxi pork ribs 10 pcs. Complex menu for 10 people, budget – 3,208.00 UAH. Complex menu for 12 people, budget – 4,106.00 UAH. Large shrimps of 2 types 12 pcs.